And that one thing is that when I say I’ll work out when I get home, IT’S NOT GOING TO HAPPEN! I left work telling myself “I’ll do my cardio at home” because I had something to do after work and wouldn’t get a good 40 min workout in had I gone to the gym at work, after work. I feel horrible but now I know. Well, not to horrible, it was the return of Master Chef on tv and I couldn’t miss Chad Johnson being fired on HBO’s Hard Knocks. I started week 3 over yesterday with a 4 mile run/walk. My knees did ok for the first 2 miles then started wearing thin so I walked for most of the last 2 miles. I did get a bit of energy for the last mile (thanks Brad Kiesling). I tell you, since my knees were hanging in there with me my left calf started hurting. The devil is a liar!! I paused, stretched it, and kept on going. I am determined. Now, I’m back to feeling like a mac truck hit me today but that’s ok….I will survive! Cardio tonight (thank God). But, I think I’m going to have to give up Zumba. All the twisting with my knee is just not good right now. I hate it because I like the class and more importantly – I PAID for it! @#$%^&! I’m sick! I have been since Friday and thus have not trained. I’ve not given up…I’ll just have to redo week 3. My knee is feeling better – thanks to everyone for the advice and encouragement!!! Arrgghhh…I don’t like getting off my routine! Week 2 Recap & Setbacks. 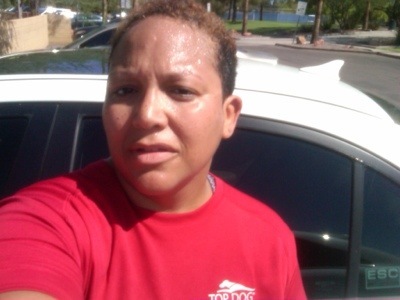 Mon: run/walk 3 miles in 50 min; Tue: Zumba; Wed: run/walk 3 miles in 48 min; Thu: Elyptical 37 min (I pushed through because my body was whooped!! ); Fri: Rest; Sat: run/walk 5 miles in 80 min; Sun: Rest! I can’t believe I am actually two weeks into this and maybe liking it just a tad bit. I found out that the first phase of my reconstruction surgery will take place October 11th. It will be a six week recovery so I will not be able to train during that time. It would be easy for me to use that as an excuse but I refuse to. Dr. G told me I’d be able to start back running in December; thus, I plan to contiue to train hard up until Oct 10th. As Pastor Marks preached in his sermon today…just because you fall doesn’t mean you fail. Call Him Up (up tempo gospel), Living for the City and Don’t You Worry Bout a Thing (Stevie Wonder) Das EFX (hip hop) and my favorite house music song Devotion (Tin City). Now, my knees still hurt, my heels are throbbing, but my hands only look like baby puffers this time. …but I DID!!! And to top it off, I shaved two minutes off my time. Thank you Aaron Janovsky for the advice. Now I still can’t run 3 miles straight but I was able to push myself to say I wasn’t ready to stop running at times. And to top that off, I was rushing to get home to relax but made a b-line directly to bible study! With all that I’m doing I should have lost 10 lbs by now but I need to get in line with my nutrition. I do find myself thinking about what I eat and making an effort to eat better, without trying, but that snickers bar sure tasted good!! I know I didn’t need it, especially being diabetic, but it gave me energy to run…at least that’s what I’m telling myself and believing it so don’t try to tell me otherwise! LOL!! As an extra bonus on today’s blog: we began diving into the book of Jeremiah in bible study. Recognize that God has a plan for you and not your plan you want God to have for you.